The federal government must do more to protect endangered North Atlantic right whales from getting tangled up in lobster gear, a leading cause of death for the rapidly declining mammals, a lawsuit filed Wednesday asserts. A coalition of environmental groups filed the suit in US District Court in Washington, D.C., against officials from the Commerce Department and National Marine Fisheries Service. 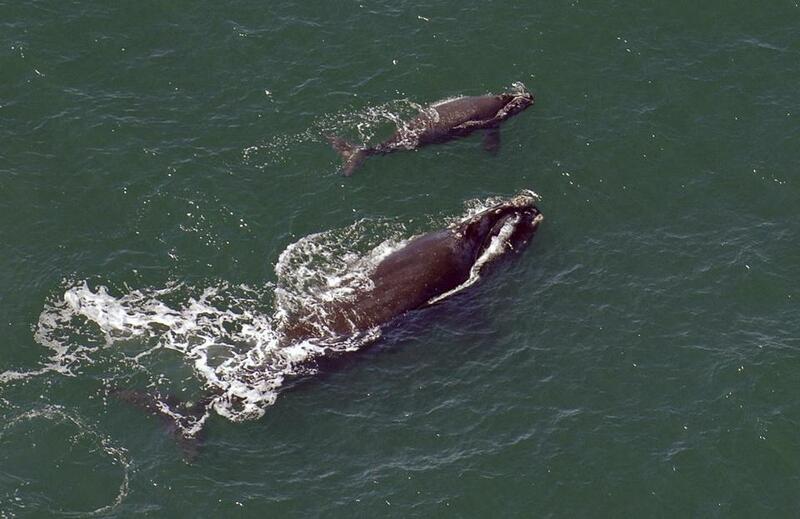 According to a 33-page civil complaint, there were only about 455 right whales in 2016, and at least 17 died last year, “pushing the species even closer to the brink of extinction.” Many of the whales have been spotted off Cape Cod. Plaintiffs want a judge to order the fisheries service to “implement additional mitigation measures to reduce the risk of entanglement of North Atlantic right whales,” among other remedies. Jane P. Davenport, senior attorney at Defenders of Wildlife, one of the plaintiffs in the lawsuit, said in a phone interview that there are a number of ways to tackle the problem, including ropeless fishing, which has been implemented in some locales for target species such as the Golden Crab. Her group is also pushing for mandatory reporting on the location of every commercial fishing trip where certain lines are used and clear marking of the ropes, so researchers can determine which areas and lines are the most dangerous for the whales. She said authorities can’t delay taking action to protect a species that researchers fear could face “functional extinction” within 20 years. The Commerce Department didn’t immediately respond to an inquiry seeking comment, and the Massachusetts Lobstermen’s Association didn’t immediately return a call. Right whales were threatened with extinction by centuries of whaling when protection was introduced in 1935. Their population rose from 350 in 1990 to 476 in 2010, but since then, there’s been evidence of decline, according to a study published in November in Nature Scientific Reports. Genevieve Davis, a Woods Hole researcher and lead author of the study, told the Globe that more of the whales have appeared to be gathering in Cape Cod Bay in recent years, possibly because of rising temperatures moving their prey, or human effects including fishing gear entanglements. Federal authorities in August declared the recent spate of deaths to be an unusual mortality event, a declaration that allows the government to provide more resources, including aerial surveys, to probe the fatalities and examine what can be done to protect the species. Two months later, a right whale was found decomposing on Nashawena Island south of Cape Cod. Martin Finucane and Danny McDonald of the Globe Staff and Globe Correspondent Ben Thompson contributed to this report. Travis Andersen can be reached at travis.andersen@globe.com. Follow him on Twitter @TAGlobe.